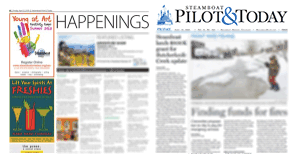 Referendum 2A has proven to produce a large amount of debate for a relatively small tax, one which would promote a 0.2 percent sales tax in order to pitch in $1.3 million, combined with Steamboat Ski and Resort Corp. and lodging companies, into a roughly $4.5 million dollar fund for investment into airline services. The argument seems to be centered around who should pay for this expansion, and if locals have the obligation to chip in to boosting tourism in the area. However, I think there is a way that these costs can be offset by all parties, and that is the closing of the Bob Adams Airfield in Steamboat Springs. The Bob Adams Airfield is an unprofitable — losing somewhere in the tune of $150,000 annually over the last few years — and irrelevant facility. Not only do we have the Yampa Valley Regional Airport for commercial services, but there are three other public general aviation airfields within a one-hour drive from Steamboat Springs located in Craig, Walden and Kremmling. The Bob Adams Airfield generated about $600,000 in 2016. If those results are replicable, a move of general aviation flights from Bob Adams to Yampa Valley can accomplish the $1.3 million asked for in two years, especially if what the money taken from excess costs is re-invested into Hayden. The true cost of Bob Adams Airfield could be in the opportunity cost; millions of dollars in real estate lying in one of the hottest real estate markets in the country. If one were to allot the airfield and sell those lots to residents and developers, the city could be looking at a windfall of millions that can go directly to the city for any number of projects and could easily cover the costs of airline expansion at Yampa Valley Regional, for both locals, lodging companies and the resort. This can also become a great way to boost the housing or commercial stock our community desperately needs. The city and those parties banking on 2A should look at options like those above as real options in improving our airline services, instead of asking for a public subsidy.